Fabric collage is one of my “things.” I have painted and dyed fabric over time and now have a nice stash of unique colors and styles to use for my fabric collages. These collages are usually attached to everyday usable items, which is a bonus. Fabric collage makes a unique product that gets many ohhs and ahhs from (mostly) my fellow artists. No everyone likes a whimsical bag on their arm. I got inspired with the last canvas mini bag and made a video of the process. To see how the other bags turned out, please check my two previous posts. Slow stitching and painting on a pouch. For this last bag check out my YouTube video HERE. I filmed and filmed and just as I was done, the camera batteries died. What perfect timing, huh? You might ask how I dye fabric. There is always the conventional fabric dyes in the stores, but I like to make patterns and mix the colors. I use mostly alcohol inks and diluted acrylic paints in spray bottles. I rinse out as much as I can, but the alcohol inks leave a pretty mighty color infusion. 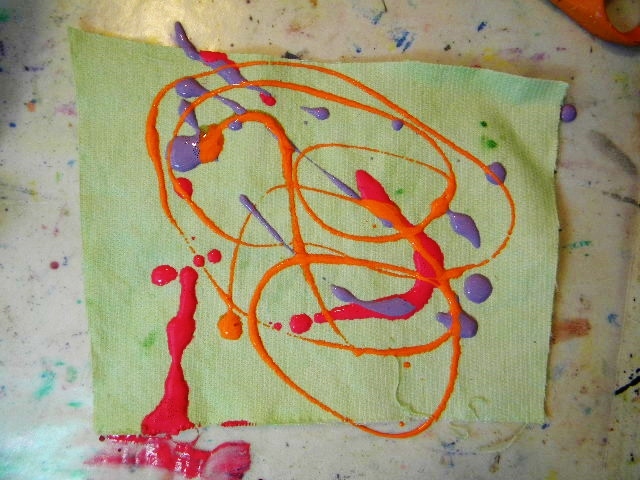 I use mostly cotton fabric because it absorbs the paints the best. The acrylic paints usually embed themselves in the fabric, and when they dry, they are pretty stiff, but still flexible enough to use. 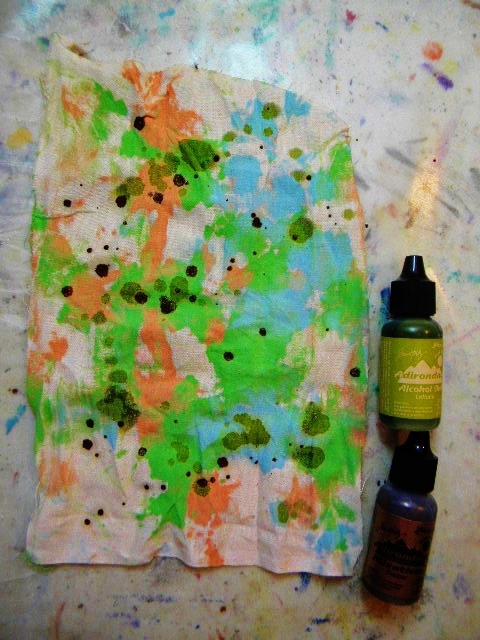 I usually just spread the fabric on a drop cloth to dry. Try different paints, and make sure they are color fast after drying, otherwise they will wash out. I have added the four fabric collage bags / pouches to my etsy shop, Earth and Faery. There are many items in my shop at the moment since the holidays are coming. I have felt a creative high for some weeks and I’m grateful for the flow. Sometimes I have long periods of no great inspiration, but I keep showing up in my studio. That’s what you do! If you want some art journaling inspiration, I have a bunch of easy videos on YouTube under my name. Keep creating. The process will make you grow. I wish you a creative and fun weekend! I found these small canvas pouches, and I decided to try my hand at some slow stitching and embroidery. It brought up memories. I used to love doing needlepoint, and embroidery, but not cross stitch. 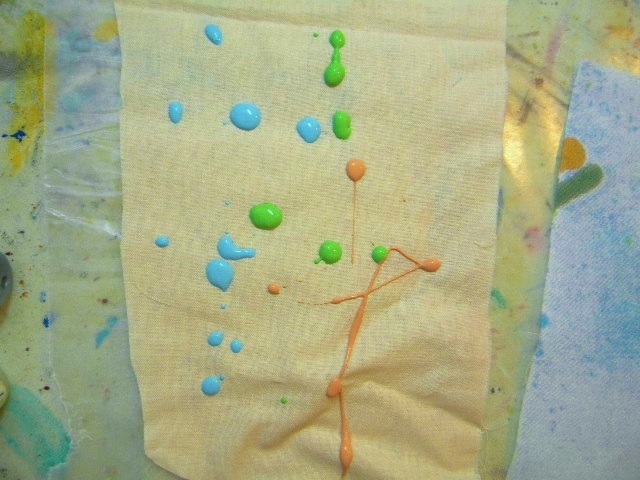 Nowadays, I make my own patterns and appliques, flying by the seat of my pants (or should I say paints. 🙂 In my previous post I shared some pictures of this project Exploring art on fabric. You will see the result at the end. 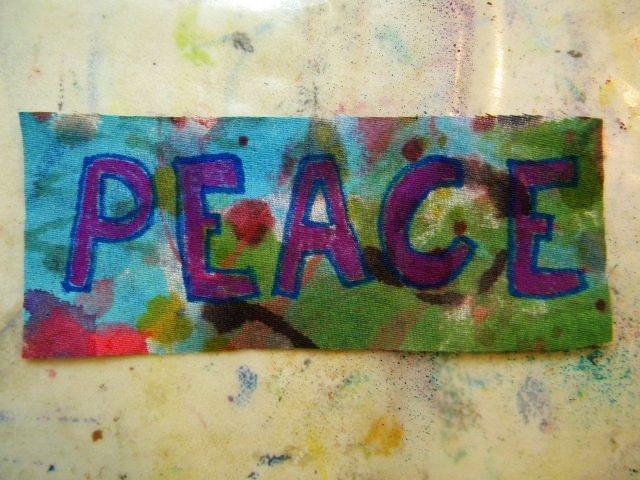 I used scrap fabric I had painted with inks in the past. I decided to applique a bird and a spiral. Simple and easy. I pressed the background fabric and the white cotton bird. I cut out a spiral from fabric painted with acrylic paints. Using medium weight fusible web I attached the whole panel to the pouch, but first I attached the details and embroidered on top. Slow stitching is like meditation, very comforting. Not too bad, huh? Very easy to make, and you can’t really mess it up. Ready to try making your own? I have three more pouches to finish. I will post some pictures of those as they are done. If you’d like to purchase this pouch, it’s available in my etsy shop, and the shipping is free. I’d say it’s a unique gift for someone this Christmas. Check it out HERE. I have a sale going in my shop throughout October. 10% off on the small mosaic boxes. Use coupon code TENOFF. 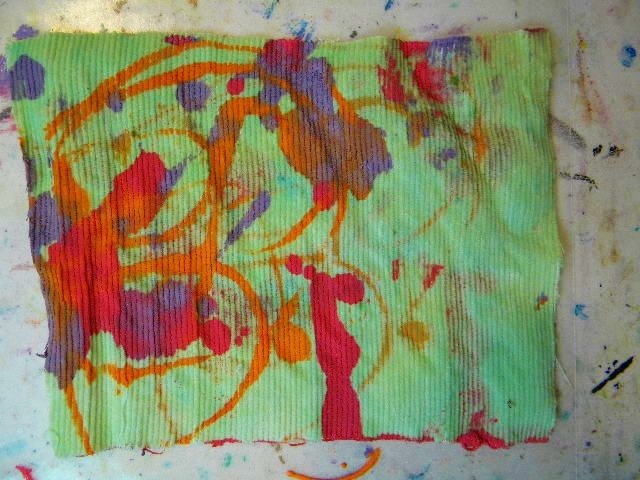 Exploring art on fabric involves taking a step out of the comfort zone. I bought four pouches with long handles online to experiment on. They are heavy-duty canvas and would fit items like a phone, passport, a small wallet. I knew I needed to wash them to get the sizing out of the fabric but I was so eager to start that I side-stepped that important step and now I suffer the consequences. I wanted to make a background with inks and paint, so I did. The inks floated on top until I have kind of hand washed the pouch and got it more pliant. Note to self: always wash new fabrics…. The first exploration came out like this, and this is the back of the pouch. It’s not necessarily bad but the paint job came out too heavy-handed in my opinion. Another thing I didn’t like about these pouches, the handle was in two parts and tied with a knot. I had to unravel part of the seam, sew the ends together, and sew it back up again. You can see the seam in the picture. Nothing major, but more work for me. I’m going to make some sort of applique like I did on this old art bag of mine in 2014. This soap opera will continue with a picture of the finished product in my next post. I did dye another pouch with blue ink and strong tea. It’s a more gentle approach, but I might add some more color before collaging the bag. It’s important to get all the wet parts done before any embroidery. I don’t want to contaminate the artwork with dyes and inks. Meanwhile, check out the items in my etsy shop. I add new things daily. For 10% off on my most popular item, the mosaic intention box, use coupon code TENOFF. The sale runs through October. EARTH AND FAERY. Until next tine, create lots!! P.S. Want to receive my email newsletter? Sign up HERE. 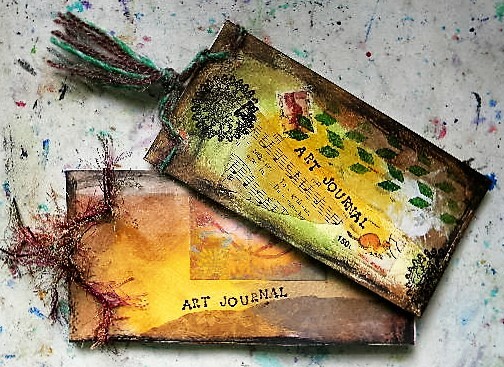 There is a special feeling of satisfaction after you make your own art journals using your unique style. 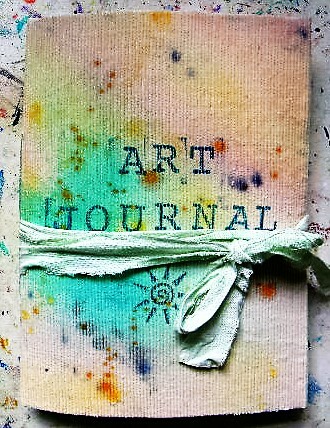 Art journaling will be less intimidating when you’re not faced with a book from the store filled with glaring white pages. When you make your own, it becomes “friendly,” something you have gotten to know during the creative process and that you enjoy working in afterwards. To participate in this e-course you don’t need any particular artistic skills other than your hands and some art supplies. If you don’t have all on the list, use what you have. We will make a shabby chic cloth-bound journal, a ledger style journal, and alter two picture books with unique pockets. You will receive three detailed videos and a PDF for parts that I could not film. 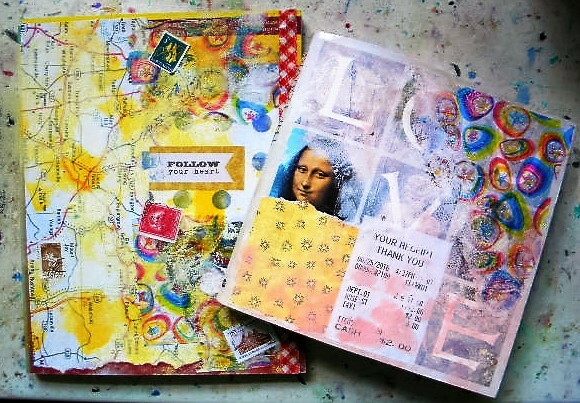 I would love for you to come and explore art journaling with me! 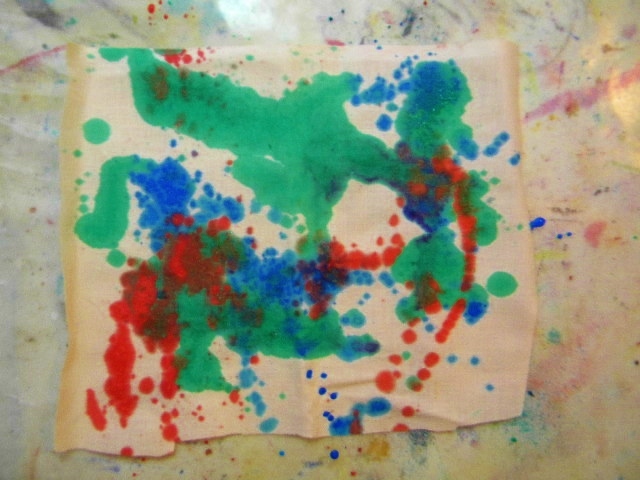 Fabric painting with a twist. You know all about fabric paints and how to use them, and the dyes in powders, but have you tried fabric painting with acrylic paints and inks that you normally use for art? 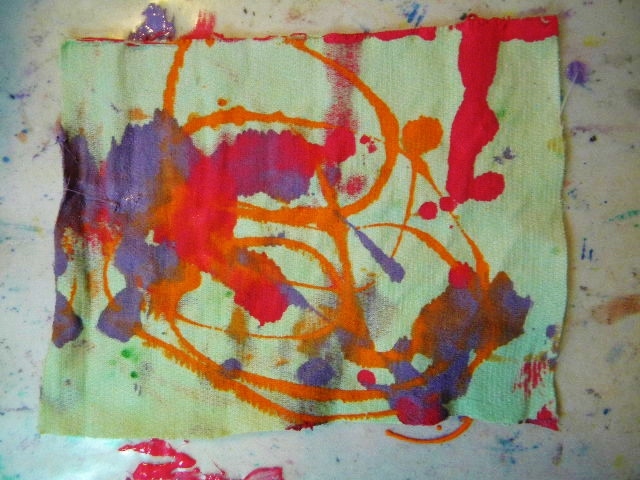 I have been painting scraps of fabrics that I use for my bracelet cuffs (video at the end.) 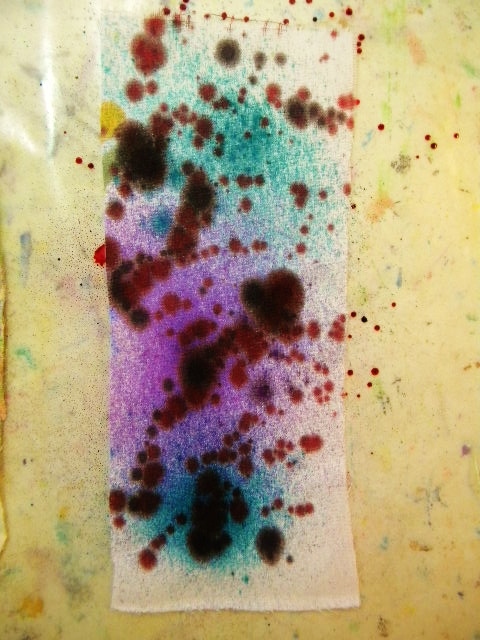 I use craft paints, acrylic artist paints, Dylusion inks, and Adirondack inks. All the material is water fast but you have to wash everything by hand in cold water and dry the fabric flat. I always use cotton fabric since it’s the most absorbent. 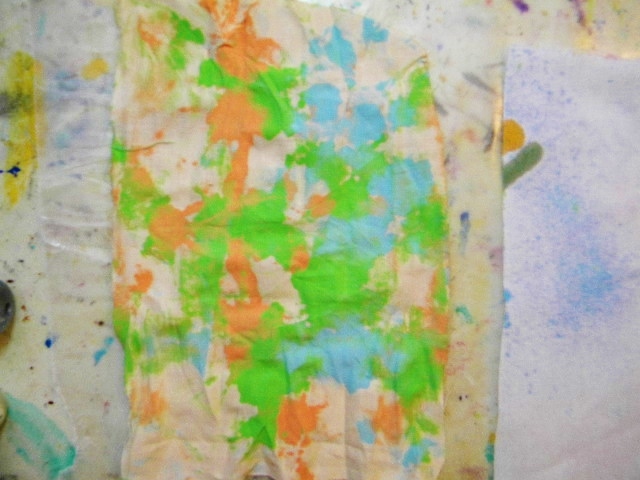 scraps of cotton fabric and paints + inks. 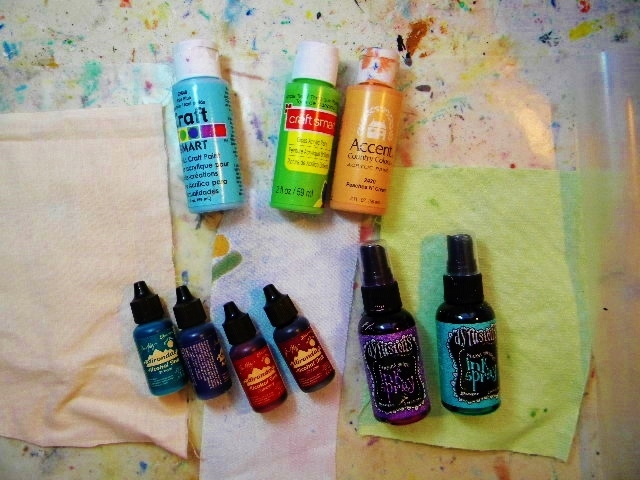 Some examples of craft paints and inks. 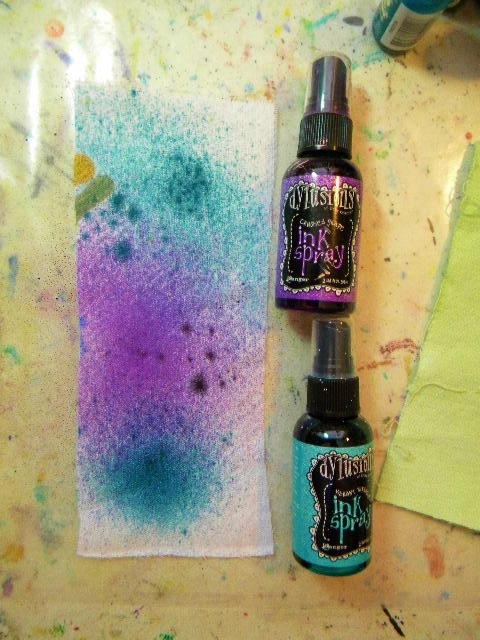 I dripped some of the craft paints straight from the bottle onto the fabric. I scrunched up the fabric into a tiny ball. If you don’t like paint on your hands, wear plastic gloves. As you can see, the paint spread all over. I added some Adirondack inks. I used the colors copper and currant. I held the bottles about 20 inches above the fabric and gently dripped the ink to get some splashes, not just globs of ink. As you can see I mix and match the materials. I used Dylusion ink sprays on this fabric. As you can see it diffuses gently. Be careful not to spray the ink where you don’t want it (including your hands.) It’s very hard to get off, and you can never remove it from the painted surface. The spray comes in yummy colors though. I used a couple of colors of Adirondack inks on top of the Dylusion spray. Pretty dramatic effect in my opinion. Here I squeezed some craft paint straight from the bottle on top of some light green corduroy fabric. I rolled up the fabric into a tight log and this is how it came out when I unrolled it. The paint bled through and saturated the other side of the fabric so I can now choose which side I like the best when I use it. Better quality artist paints diluted into spray bottles. 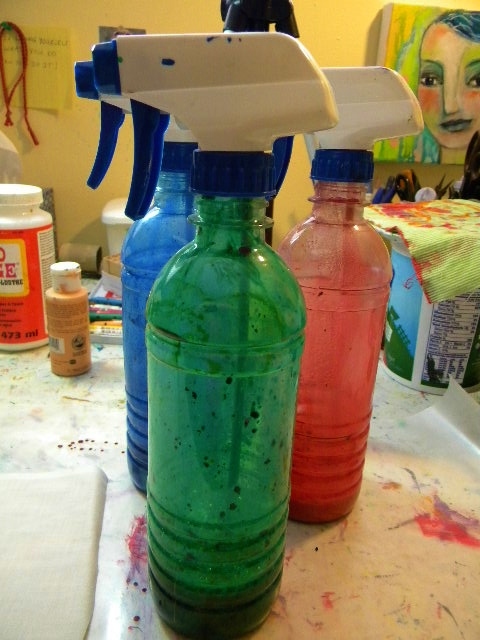 You can make very diluted acrylic artist paints in spray bottles and use that too. From the spray bottles on some muslin. I finished that with some drips of Adirondack inks. The fabrics dry pretty stiff. You can iron them flat between newspaper or other protective paper. You can add other fabric and fusible web to make them even more solid. 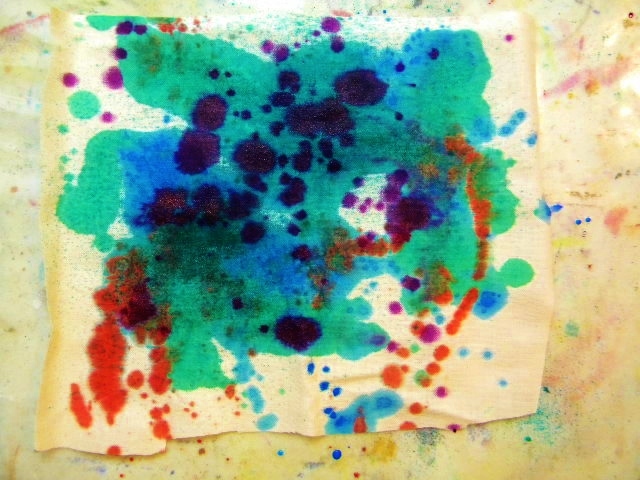 It is a FUN way to create your own fabric. I love to make things out of it, like fabric bracelet cuffs. Check out this YouTube video if you want to see how I made a cuff.